The Annual Perseid meteor showers are back with even more intensity this August as Earth crosses the orbit of the Comet 109P/Swift-Tuttle. 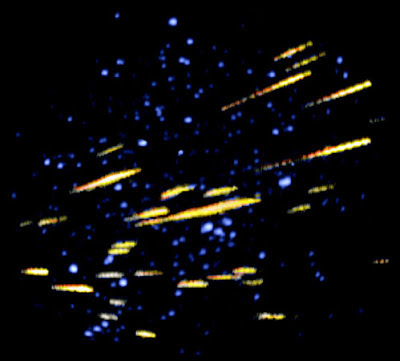 The Perseid meteor showers are actually leftover debris from Comet Swift-Tuttle, discovered in 1862, which takes 130 years to circle our solar system an is expected next in 2126. The Perseid meteor shower appears to originate in the northeastern sky, near the constellation Perseus, and shoot off in all directions. On August 11th & 12th as Earth passes through the densest part of the debris stream we can expect to see dozens of meteors per hour. 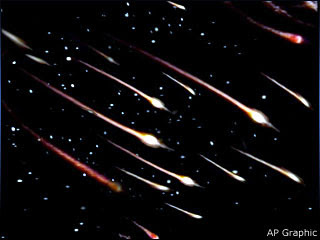 Meteor showers occur when earth crosses the cometary orbit. As comets move about their orbits they leave a stream of debris when dust and rocky material is liberated from its head as the ice vapourises. On August 12, the waning gibbous Moon will rise before midnight and climb higher hour by hour. It will be fairly bright, with more than 60 percent of its surface illuminated. Perseids can appear in any part of the sky, their tails all pointing back to the shower's radiant in the constellation Perseus. Get away from the city lights if you can for a better view. Known as the most brilliant of annual meteor showers, the Perseids, at its peak, can emit anywhere from 50 to 150 shooting stars an hour.